Most hunters take great joy and satisfaction eating the venison they have worked so hard to bring to the table. Besides the great taste it is healthy - low in saturated fat, and lacking the antibiotics, hormones and other chemicals, found in most store-bought meats. But recently there have been reports about possible human danger from eating infected venison. Chronic Wasting Disease (CWD) has been falsely blamed for illnesses and even deaths. In this article we will look at what is known about CWD, the facts, and assess the risks, if any, to hunters. Chronic Wasting Disease is a disease which effects the brain tissue of deer and elk. The disease causes them to behave erratically, lose weight, become lethargic and eventually die. It is 100% fatal in infected animals. CWD was first found in a Colorado research facility. While these first cases involved captive animals it has since spread to surrounding wild populations of deer and elk. CWD is within a family of diseases named Transmissible Spongiform Encephalopathies (TSE). Bovine Spongiform Encephalopathies (BSE) and Scrapie in sheep are also found in this family. A disease called Creutzfeldt-Jacob disease, which can occur naturally but is also linked to Mad Cow Disease, also affects humans. The cause of these diseases have been the subject of intense research and debate. As you know, bacteria and viruses cause infectious diseases. The scientific community has a pretty good handle on the mechanisms (tools) germs use to make you sick and ways to kill the offending agent. So far, we have been much more successful at killing bacteria than killing viruses. But recent improvements in antibiotics are making headway in the treatment of viruses. However, when scientists attempted to isolate the infectious agent for CWD they could find no virus, or bacteria. They did note a change in the protein structure of the brain but felt this was a result of the infection. Microscopically the infected brains had lots of holes. In essence, the brain look like a sponge. At the same time researchers were investigating the cause of Creutzfeldt-Jacob disease in humans. This research led to a new classification of infectious disease, caused by a new germ called a prion. Prions are abnormally shaped proteins, which cause other proteins in the infected animal to take on this altered shape. These altered proteins continue to spread causing dysfunction and eventually leading to the animal’s death - thus the term "Mad Cow Disease." Prions have no DNA, genes or any other of the typical features found in living organisms. It is still unclear how the prions trigger the animal’s own proteins to change shape and some researchers do not believe that prions are the cause of these diseases. Instead these dissenting opinions believe that they are caused by some type of slow virus, one which is very difficult to detect. The reason that this is important is that it impacts future research and possible treatment strategies. Prions seem to be fairly species specific. When the captive deer in Colorado became infected none of the captive sheep or pronghorns got CWD. However, some of the elk did. This makes sense because proteins from other species are probably seen as foreign by the infected animal and eliminated. Abnormal proteins from the same species are probably accepted by the animal’s immune system. 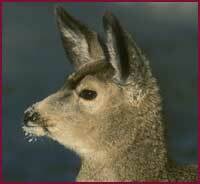 It is thought that elk and mule deer share enough similar proteins that the disease can be passed between species. Mad Cow Disease is the only TSE that has been confirmed to be transmitted from animals to humans. Scrapie in sheep has never been found in shepards and there have been no confirmed cases of CWD in humans. Some researchers believe that other TSEs are transmissible to humans but occur at such low frequency that it is difficult to make a link. They believe that the reason we know that Mad Cow is transmissible to humans is because so many cows were infected that there were hundreds of thousands of exposures. Since so few people are exposed to infected wildlife it may be difficult to make the connection. It does appear that spongiform encephalopathies is difficult to pass from one individual animal to another. It probably takes repeated exposures, such as in captivity or in overcrowded populations. The prion is likely ingested through infected feed or animal tissue. Mad Cow Disease was spread in England because of the practice of feeding cows scrap meat as part of their feed. It is believed that the meat scraps contained the prions. People contracted Mad Cow when they consumed the infected beef. In infected animals, brain and nervous tissue contains the greatest amount of prions and carries the most risk. FACT CWD and Mad Cow are classified within the same virus family, but they are not the same disease. should be worn and disposed of when finished. All game should be boned out prior to cooking as nervous tissue often runs very close to bones. Minimize the handling of brain and spinal tissue. The CO and WY fish and game departments can test animals for CWD. There is a fee for this and results can take up to ten weeks. For the vast majority of hunters this will not be necessary. A healthy-looking, vigorous, animal that is handled appropriately does not need to be tested. It should be noted that no amount of cooking or freezing will destroy the prions if the animal was infected. Following these simple precautions should greatly minimize risk. Wild game meat is a pleasure on the table and typically much healthier for you than domestic beef. My family and I will continue to enjoy the healthy benefits of venison as often as I am fortunate to harvest our dinner. 1) Don't shoot an animal that is acting abnormally or looks sick. 2) Wear rubber or latex gloves when you field-dress your animal. 3) In areas where chronic wasting disease has been reported, minimize your contact with a dead deer's brain and spinal cord and wash your hands after contact. 4) Don't eat deer brains or spinal cord. 5) Bone out your deer meat and discard the brain, spinal cord, eyes, spleen, and lymph nodes.